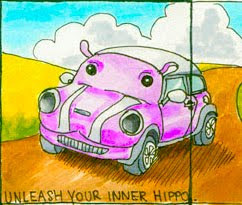 ...a mini hippo! This little illustration was done as a part of Carla Sonheim’s The Art of Silliness 2 workshop last fall. The awkward black line is there because I didn’t have the composition quite right and ended up spilling out of the frame that was provided on the worksheet.